Our 3 light beam pendant features hand scraped solid Alder wood with hand forged iron brackets. 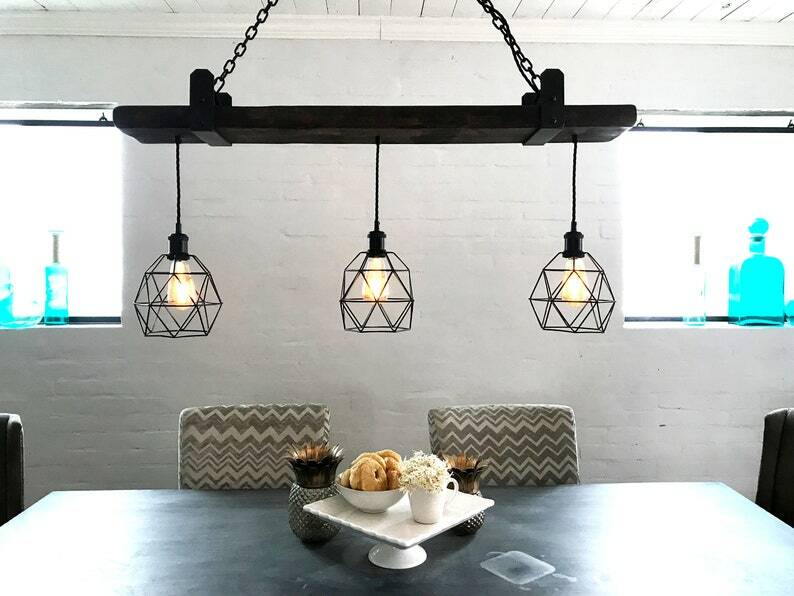 Light can be configured with either glass globes, wire cages or bare Edison bulbs. Mounting plate is 5" x 10" thick steel. Custom hanging lengths can be requested. Design can be mounted on sloped or cathedral ceilings as well. For Commercial applications please message before placing order. The chandelier is very well made. The seller was wonderful to work with. He was very willing to customize based on what we needed and his communication was prompt and friendly. HIGHLY recommend this seller !! LOVE the character of this light!!! It shipped quickly, looks beautiful, and the shop owner was easy to work with! I took a long time trying to find what I wanted and have been happy with this choice! All lighting is custom made to order and as such we cannot accept returns due to change of heart. Please take to time using measurements, descriptions, and pictures to ensure the fixture will work for you. Also please ask any additional questions you may have.